The Syrian rebels have continued their crusade to bring Islamic law to rural areas of that country. In the latest atrocity, a Syrian spokesman narrated an amputation of a hand by a man that the rebels said asked to punished for theft “in order to cleanse his sins.” In the twisted mind of these extremists, the video was supposed to show the purity and righteousness of Islam as a sword is used to sever the hand of the man. The blind-folded thief required four hits to do the job and the rebels then rejoiced as his severed hand and bloodied arm lay across the table. The rebels then posted the video. 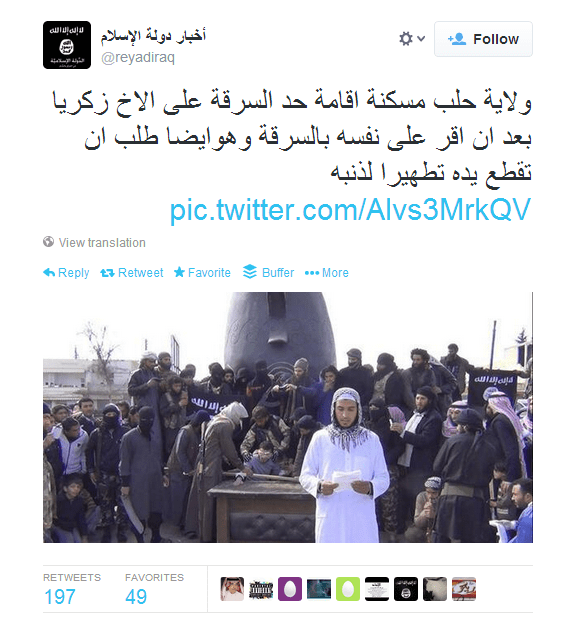 Twitter took the video down after the posting from Islamic State of Iraq and Syria (ISIS). You may recall the rebels as the scary clowns who cut off the head of a wounded captured soldier and then danced around with it in celebration until someone mentioned that he had one of their own soldiers. Other rebel groups have declared war on ISIS (and Al Qaeda has disassociated itself from the group). Yet, young Islamic fighters still find scenes like this to be an a true expression of morality. Then there is the question of the “voluntary” amputation. One would think that such a religious epiphany would precede the theft. This particular religious epiphany seemed to happen after the ASIS captured the man. In response to rcampbell: The difference in the two religions is that the Christian religion has changed as we became more civilized, but the Muslim religion continues to live in the dark ages. Also, the reason religion doesn’t make sense to you is because you haven’t delved deeply into the scriptures nor history enough to understand how customs and beliefs were back then compared to now. Christian’s know God to be loving and forgiving, while Muslim look at God as a punishing divinity. BTW, Muslims believe in the Virgin Birth of Jesus also. With most of the comments so far have we forgotten about the terrible attack against this man and his anguish? To my knowledge, no one refers to “the pilgrims” as immigrants. Let’s just say “something else,” shall we? How can this man atone for his own sin of stealing by asking for his hand to be cut off? alex, i’d like “religious people do crazy $hit” for 200, please.